1 Eco-friendliness . Give preference to natural fabrics made of cotton, linen or silk. These materials are not electrified and are completely safe for the baby. 2 Practicality. Choose simple curtains designs without complicated draperies that will not collect dust and contribute to the development of allergies. In addition, the laconic cutter curtains, the easier it is to wash them. 3 Security. 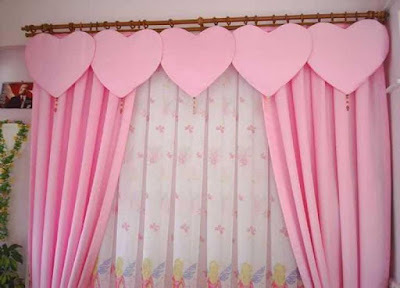 If your child is still very little, you should not decorate the kid's room curtains with all sorts of additional accessories (beads, artificial flowers, appliques, fringes, etc.) that he can tear off and swallow. 4 Protection from the sun. A strong and healthy sleep is very important for every child. Therefore, you need to choose a fabric that will reliably protect against sunlight. Also for this purpose, you can use the curtains (Roman, roll) from dense fabric or material blackout in combination with curtains. 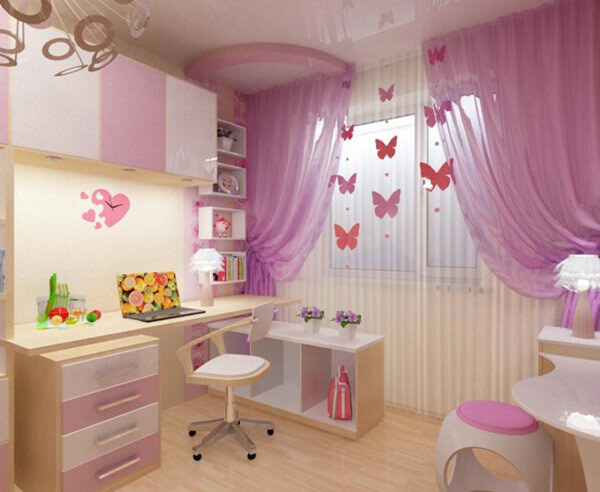 If your baby is still very little, you will probably try to decorate her room in a romantic style. This is an excellent choice for spacious and bright rooms. On the window, for such a child, hang the most elegant curtains. If you like, when soft light pours through them, choose the products in a soft pink or warm peach scale, but you can choose any pastel shades. 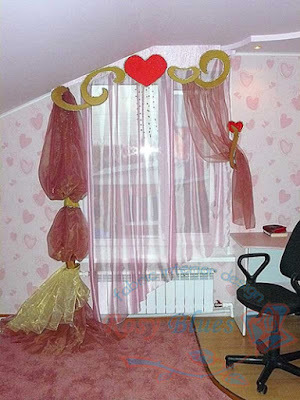 We have selected for you a selection of photos with ideas of curtains for a girls room. 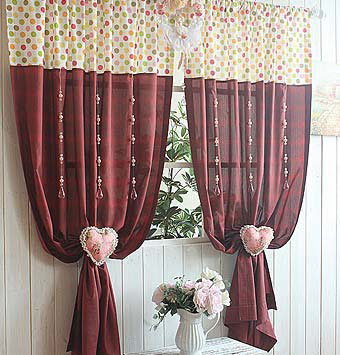 Fans of bright colors can choose another original solution: decorate the window with colorful curtains of muslin. The layers of this translucent material will create amazing color effects and really transform the room. As decorative elements for such curtains, you can use wide pick-ups or tapes, they will easily adjust the lighting of the room. The main thing is to make sure that their edges are well fixed. In the kid's room, the kids Do not use the room only to sleep, it is the place where they spend most of the day, play and learn. Therefore, when decorating this room, it is important to take into account all the nuances that can affect the state of health and mood of the child. For this age the decor in the romantic style with not very bright shades is good. Older girls are very sensitive and vulnerable, so the decision to choose one or another style of the interior of their room should not be taken only through joint efforts. His own room for a teenager is a kind of "shell" in which he can hide from all the complexities and imperfections of the outside world, gain confidence in his forces so desired at this age. Therefore, creating a comfortable atmosphere for the child in the room is a direct responsibility of the parents. 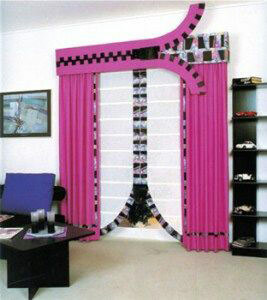 The key to creating an attractive interior is the right curtains for the kid's room. For a girl of this age, you can use a variety of stylistic and color solutions, most importantly, that they meet the tastes of the hostess and correspond to fashion trends. If the interior is chosen in a modern style, the ideal option will be rolled or Roman blinds. the ability to fasten the curtains in a raised position. The latter factor is especially important since it makes it easier to access the sill and use it as an additional work surface. 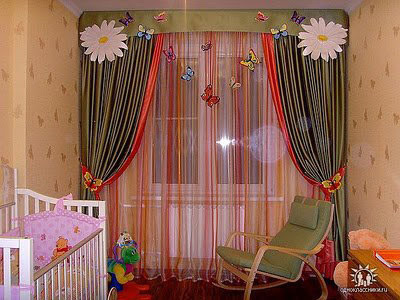 For babies, which are not yet three years old, you should choose curtains made entirely of natural materials. Satin, cotton, and cotton are ideal, and cambric or calico is made of light fabrics. Curtains should not be too transparent, otherwise, in the light of the year the child will fall asleep badly and wake up early, the baby's organism reacts very sensitively to the light rhythms. So curtains are needed tight. 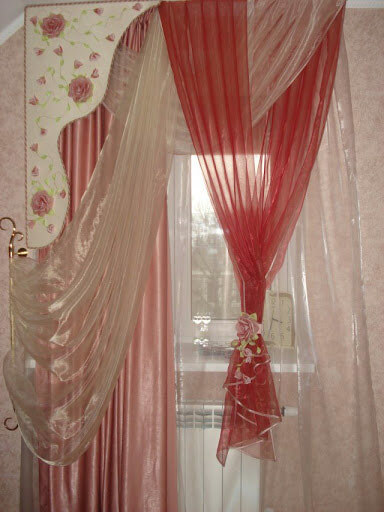 The color of the curtains in the room of the little princess must be soft, pastel shades. A solution will be successful when the color of the textile matches the color of the walls. For a change, let the curtains be decorated with small nice drawings. However, from the point of view of the psychological comfort of the baby, nothing terrible will happen if the curtains create a single visual space with the wall. This will enable the girl to feel protected. If you select curtains for a kids room, the inhabitant of which is 3 to 6 years old, you can afford and more diverse options. Still, it is desirable that the material for the curtains is entire of natural origin. Do not particularly look at modern roller blinds, roller blinds or Roman blinds. They are all controlled by a chain or rope mechanism, and at this age, it is better to avoid the presence of tempting hanging chains or cords. The coloring of curtains can be more diverse. 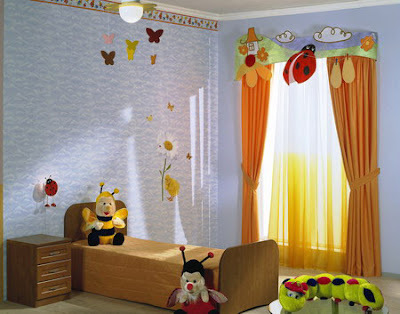 For example, bright drawings of toys, animals, birds or plants will very much revitalize the kid's room. Fantasy drawings will make an irrepressible childhood fantasy come into play. Those parents who care about the intellectual development of the kids can choose curtains with the alphabet of different languages, figures or geometric figures, including wavy and broken lines, incomplete circles and polygons. Psychologists claim that such patterns stimulate kid's imagination, prompting it to complete. For younger school girls, curtains for girls room can become more functional. You can hang roller blinds or comfortable and beautiful Roman. Make sure that they leave sufficient light and air. 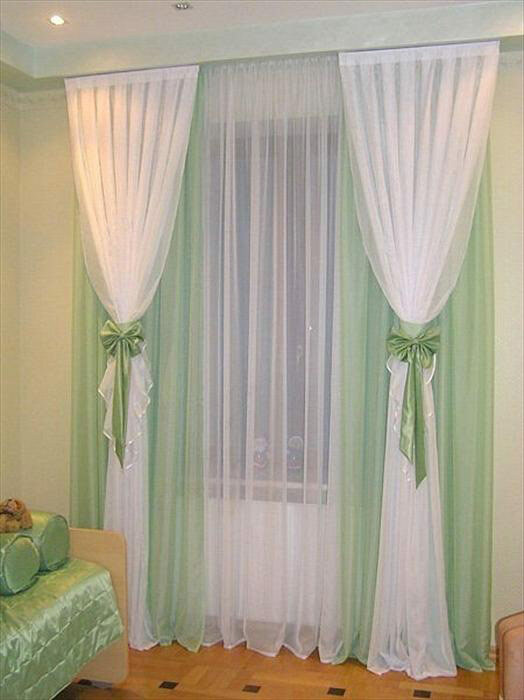 You can choose modern functional materials that provide increased the practicality of curtains. As for the coloring, it can become less childish. Images of toys can change geometric decorations - strips, concentric circles of different diameters, and even abstract drawings. It's okay if they are bright, but it is better to avoid an excessive abundance of red. Give preference to the shades of orange, green and blue on a pastel, light background. Then the curtains will not disturb the vulnerable kid's psyche too much and will become a beautiful, saturated color accent in the interior of the kid's room. Curtains for a teenage girl are better to choose with her. There is room for experiments and bold, unexpected solutions. 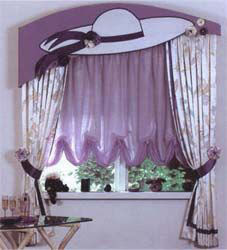 Maybe it will be multi-layered curtains using additional appliqué, mesh or fringe. Maybe the daughter will want her own photo printed on a roll curtain. And, maybe, she will want to paint or embroider fabric for girls curtains. The temperament and habits of the inhabitant of the kid's room play an important role in the selection of curtains in the kid's room. An active, lively girl, who is prone to emotional overexcitation, will approach curtains of calm and cold shades. For example, the colors of mignonette, spring greens, sky-blue, soft pink and light yellow. If the child hardly calms down in the evening, falls asleep badly, then the monotonous curtains of pastel shades will help to calm down, among which the key role is played by the same pink and green. If the girl is difficult to concentrate on classes, then the color of the curtains is better to choose strictly. For example, dark blue, with gray and metalized patterns. From blue and pink, in this case, it is better to refuse, as they will have a relaxing rather than a concentrating effect. A girl who lacks firmness in character or in defending her interests will benefit from the bright orange color of the curtains. It will help to instill confidence and steadfastness into a little heart. kids room drawings can also be relevant in a room for teenagers. Such an ornament of curtains will help the growing girl feel under the protection of familiar walls. Especially it is necessary for those who change school or are subject to the influence of other stress factors. True, such drawings should not be insisted if the child is against. Perhaps your daughter is much stronger than you think. Abstractions and spirals like the nature of strict discipline of the mind, analytical warehouse, or, on the contrary, creative and non-standard thinking. Sometimes such kid's room chooses images of optical illusions for girls curtains. But with this, you need to be cautious, as long contemplation of such ornaments can tire the psyche of a teenager. This factor is of great importance, especially if it is a kid's room. After all, the girl needs as much space as possible for games, classes, socializing with family and friends. What curtains to choose for the kid's room, depending on its size? If the room is small, should not the curtains be too bulky? Refuse from festoons, waves, magnificent frills or multilayered compositions. A good option will be a roll or Roman curtains, which are attached to the sash windows. If we are talking about the room of a little girl, then short curtains of dense fabric on the eyelets will come in handy. Better, if they are opened, they will be fixed using picks, securely fixed to the wall on the side of the window. Visually raise the ceiling of a too low room will help long curtains with vertically oriented ornament. At the same time, they can be fixed under the ceiling. Going down long panels, they will create a feeling that the wall has become taller. A narrow kid's room with a window in the end wall can be adjusted with bright curtains. Their background may coincide with the color of the walls, but the original, multicolored and unusual ornament will make them more visible, and the distant wall will visually approximate. This will create the feeling that the room is not so long. For this option, you can choose curtains with a full-color image of wildflowers or geometric figures of juicy color. Visually widen the wall will help dark curtains framed by light walls. You can choose a fabric with wide transverse stripes. It will also help create the impression that the window opening is wider. Choosing the right curtains in the kid's room for the girl - it's not easy. 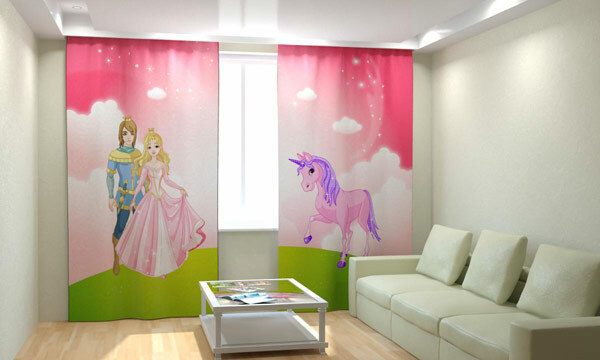 Taking into account all the unnecessary factors and recommendations, you can make a really good choice, and decorate the room for the princess with perfect curtains that will not only look good but also create the most beneficial atmosphere for the child's harmonious growing up. Choosing the color for future curtains in a baby girl, pay attention to the following nuances. If the windows of the kid's room look north, east or west and most of the daylight is not enough, it is better to choose curtains of warm shades of the color palette: yellow, orange, beige, coral, pink. If the kid's windows look to the south, and most of the day it is well lit, it is better to choose curtains of cold colors: blue, lilac, silver, turquoise. 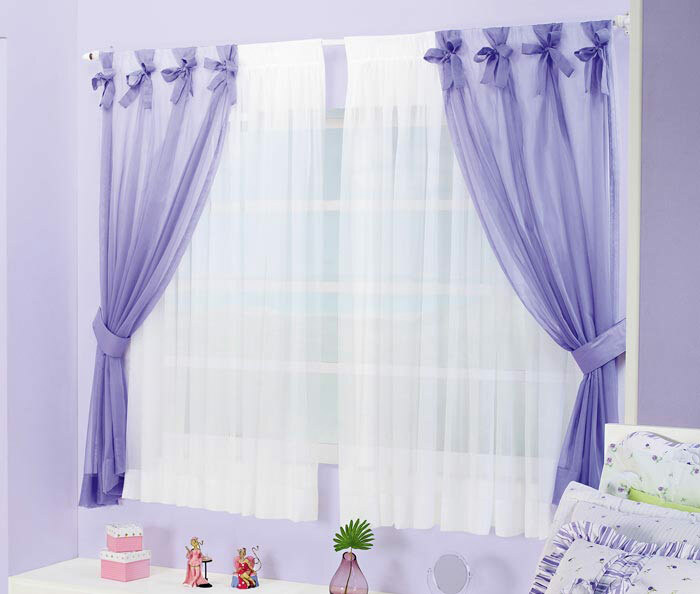 The universal colors for curtains in the girlish kid room are considered beige and white. They will balance a much-variegated situation, fit into most interiors and will be appropriate in a girl's room of any age. For a small and poorly lit child, it is preferable to choose light curtains. They visually increase the space, and will not mute the already dull daylight. 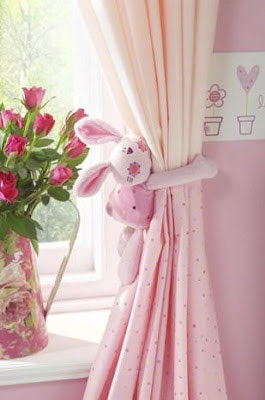 In the room for babies from 0 to 3 years are more suitable for single-color curtains in gentle pastel colors. Such colors calming and promote a sound sleep. 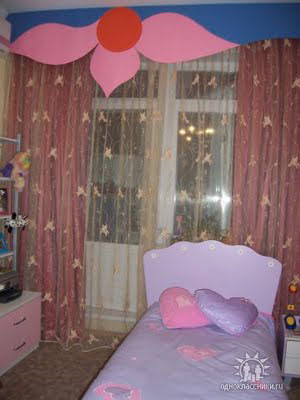 Older girls, from 3 to 12 years old, can choose curtains brighter, cheerful and saturated, but in no case not screaming shades. 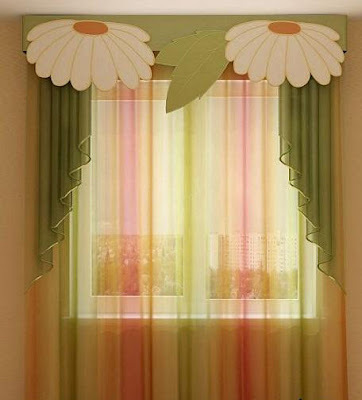 Young ladies over 12 years old, most likely, will like curtains made of adult fabrics of neutral color, or curtains of "teenage" very bright colors, for example, turquoise or lemon. curtains for girls room often acquire the last turn when the kid's room is already furnished, focusing on the color of the walls and the upholstery of furniture. But if you are still just thinking about the design of the future kid's room, use the opportunity to create it, depending on the color and pattern of the curtains. You will find that selecting wallpaper, textile elements, and interior accessories is much easier when it is already known how the windows will be designed. 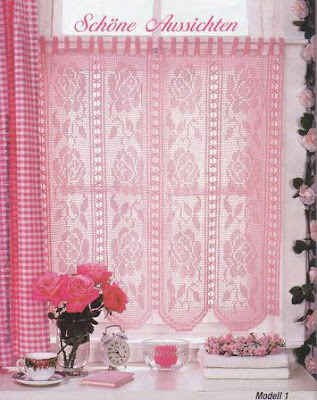 Fabric for sewing curtains should provide enough room for shading, do not burn out under the influence of sunlight, do not attract dust, it's easy to wear off, and also, if possible, muffle sounds that are heard from the street. Optimum option for cost, practicality and aesthetic appearance - blended fabrics (polycotton), as well as fabrics of synthetic fibers, with properties close to natural analogs (viscose, modal). If the priority for you is 100% natural, choose linen or silk. However, keep in mind that fabrics without synthetic additives burn out in the sun and after washing give a shrinkage of 15-20 cm. If you plan to sew blinds yourself, then it's best to pay attention to polycotton and cotton. These fabrics are whimsical during processing. Having decided with the fabric, color, and pattern, we move on to choosing the type of curtains. In this regard, consider the following nuances. 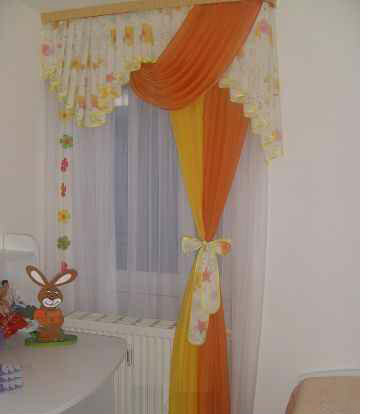 The most comfortable and safe for the kid's room curtains - length to the window sill: Roman, Austrian, London, roll. Soft draperies build, ruches and festoons are in the nature of a romantic girl's nature. 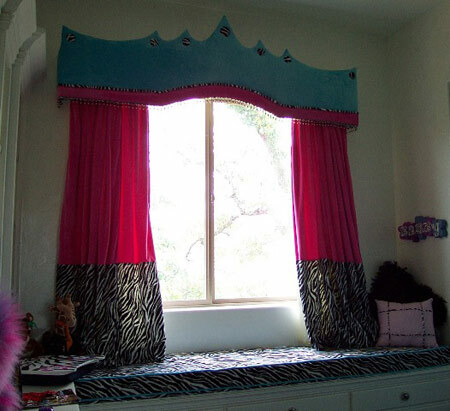 However, for kid's curtains do not need to make them too lush and plentiful. Numerous folds accumulate dust and complicate washing. Multilayered compositions of curtains and lambrequins look very beautiful and feminine, but they are not too practical. 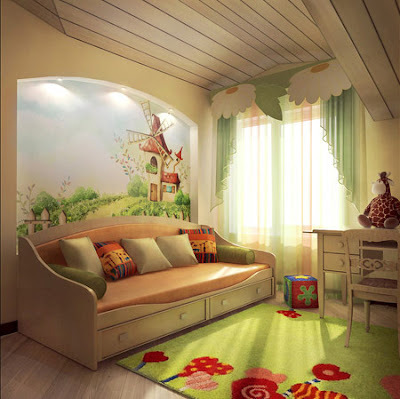 To comfortably dose a daylight for a kids room, it is better to choose a more simple and easy-care combination. 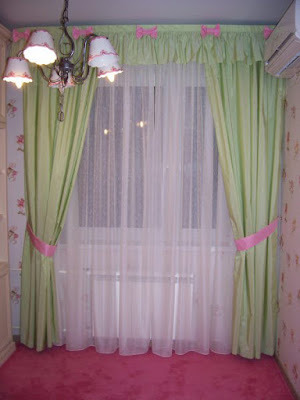 For example, Roman, Austrian, roll or London curtains in combination with simple curtains or tulle. Kids who just learn to walk and explore the world like to play with curtains, pull them and pull. 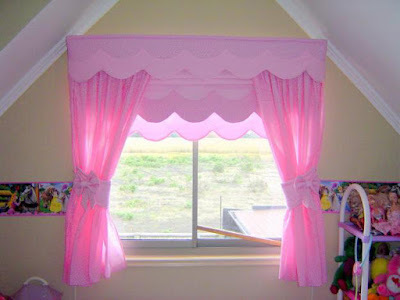 Therefore, in the girl's room for babies under the age of 3, long curtains should not be hung. 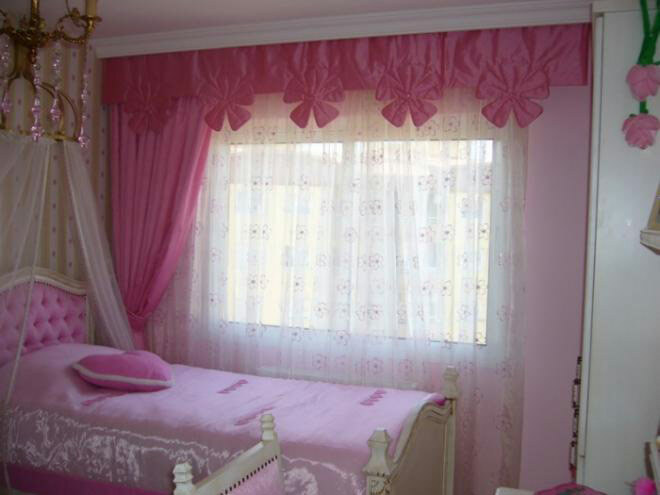 For a teenage girl, you can choose any style of kid's room curtains. The main thing is that they like her most. Do not forget about accessories: picks, brushes, bows, magnets, all kinds of clips. They will bring to the interior the charm and uniqueness, especially those that you will do with the child with your own. 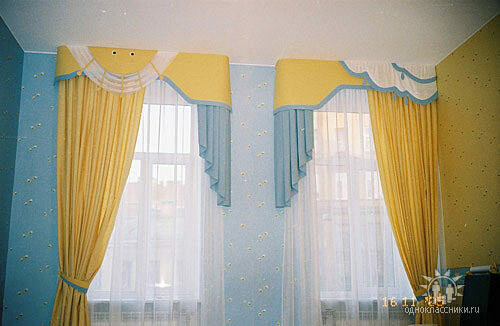 Whatever curtains for the design of the kid's room you have not chosen, this decision will be successful. After all, it is dictated by the love for your child and the desire to fill the surrounding space with warmth, coziness, and care.